Boyle is steeped with history. The area is rich with historic houses and sites which offer an in depth look into life before the 20th Century and what Ireland was like in the midlands at that time. Hear the legends of Lough Key by taking the Lough Key Experience, see the lavish life King’s lived by taking the interactive tour at King House, or witness the impressive Boyle Abbey, all situated on Boyle’s doorstep. More details of all heritage sites in Boyle and the surrounding areas below. Abbeytown bridge is one of the oldest of its kind in Ireland. It was built between 1190 and 1220 when the Abbey was founded. It is one of the only two built entirely of stone, not stone and masonry – It has not been changed since it was built. In the picture on the right you can see the bridge along with Mitchell’s B&B and Boyle Abbey before it was renovated. Easter to end September: 7 Days per week - 10.00am to last entry at 5.15pm with closure at 6pm. The Carrowkeel/Keshcorran Megalith complex is located west of Lough Arrow just outside the little town of Castlebaldwin and is the site of the largest concentration of passage tombs in Ireland. Carrowkeel is spectacularly located in the Bricklieve Mountains. These tombs are most usually located high upon hills and mountains and dot the landscape around Sligo County, forming a larger network of ancient sites whose mysterious origin is still largely debated. The Carrowkeel complex, believed to have been constructed between 3000 and 2000 BC, remained in use until 1500 BC. The cairns, built of limestone with interior chambers roofed with large limestone slabs, range in size from 25 to 100 feet in diameter. The site was used in Christian times as a burial place for unbaptised children. Keshcorran Mountain is capped by a large un-opened cairn, known as the pinnacle. Seventeen caves are located on the western side of the mountain. The hill and it's surroundings feature in a number of legendary tales including a story that tells of the birth of Cormac Mac Art. Cormac Mac Art was the most famous of the legendary kings of Ireland and was born at a well beneath the caves. His mother had given birth to him while trying to escape from Lughaidh Mac Conn who had killed her husband. While they lay sleeping baby Cormac was carried off by a wolf whose den was in a cave now known as Cormac's cave. Cormac was discovered years later playing on all fours outside the caves with wolf cubs. Cormac went on to become a famous High King of Ireland. The Dolmen located outside Boyle, Co.Roscommon, is a fine example of a portal dolmen, and was built before 2000BC. The word “dolmen” is Celtic in origin and means “stone table”. The great capstone, 4.5m x 3m wide, is one of the largest to be seen in Ireland. Find it by taking the R294 for 5km (3 miles) from Boyle. Continue under railway bridge and on your right there is a gate into a field. This field is privately owned and one should seek permission before entering andand should only be accessed with care via the gates at the railway crossing provided by Iarnrod Eireann. Two miles north of the town of Boyle, is the site of the Battle of the Curleius, which took place in 1599. It is commemorated by one of Ireland's most magnificent road-side pieces of sculptured metal of a Gaelic Chieftain, sculptured by Maurice Harron. There is a picnic area provided allowing one to sit and take in the magnificent views over Lough Key. The Battle of Curlew Pass was fought on the 15th of August 1599, during the campaign of the Earl of Essex in the Nine Years' War, between an English force under Sir Conyers Clifford and a rebel Irish force led by "Red" Hugh O'Donnell. The English were ambushed and routed while marching through a pass in the Curlew Mountains, near the town of Boyle, in northwestern Ireland. The English forces suffered heavy casualties. Losses by allied Irish forces were not recorded but were probably minimal. King House was built by Sir Henry King around 1730; it is a house of unique architectural and historical importance. With the aid of exciting special effects and life size models in recreated scenes you are taken back through the long and compelling history of the house and the people who lived in the area. Every opportunity has been taken, with the use of interactive displays, to ensure that visitors, children and adults alike, are able to experience life as it was for the people who occupied the house and lived and work locally. King House can be available all year round for groups over 20 or for functions/weddings/concerts etc. Boyle Civic Collection is now widely considered as a collection of paintings and sculptures by the very best of contemporary Irish artists. The acquisition of works commenced in 1990, and the ever-expanding collection now is in excess of 150 paintings and sculptures. Boyle town library is located in the basement of King House and originally would have been the kitchens, stores and servant quarters of the House. The original flag floor and barrel vaulted ceiling are still in place in this excellent facility. A comprehensive reference section within the library house many important local documents and books including the annals of Boyle, the annals of Lough Key, histories of the Earls of Kingston and the Connaught Rangers, Estate records from the Rockingham Demense and Griffiths Valuation in the reference section. The Connaught Rangers museum is a unique display of donated artefacts and family mementos belonging to the soldiers who served in this famous Irish regiment before the foundation of the Irish state. King House is also home to the Connaught Rangers Association, an organisation dedicated to remembering this proud regiment. As well as taking part in memorial ceremonies the association provides genealogical support for ancestors of men who served with the Rangers. Former President McAleese has kindly donated state gifts from her time as President of Ireland to the nation through the Office of Public Works for the enjoyment of the people of Ireland. Roscommon County Council is delighted to present the exhibition of these State Gifts at the historic King House in Boyle. Maureen O’Sullivan was born just yards from King House as her father was a Captain in the Connaught Rangers. Follow this Hollywood icon’s journey from local girl to movie star. Maureen starred in 70 movies but is perhaps best known for her turn as Jane Parker in the Tarzan movies of yesteryear alongside Johnny Weissmiller. A true queen of the silver screen. Lough Key Forest Park, a popular destination for recreational walkers. The park, opened in 1972, covers 865 acres (350 ha) formerly part of the Rockingham estate. The Moylurg Tower, standing on the site of the old Rockingham house, now stands overlooking the lake to the north and lawns to the south. Sir Cecil Stafford-King-Harman (1895–1987), second (and last) Baronet of Rockingham, ensured that the land went back to the people of Ireland through the Irish Land Commission, who subdivided the pasture land into several farms of approximately 50 acres (20 ha) and granted these to local people. An extensive area around the then-derelict Rockingham house became the Forest Park and this was looked after by the Department of Forestry. Discover how this fascinating landscape has been shaped; from underground to up amongst the treetops, ‘Irelands only Tree Canopy Walk, a truly unique experience immersing you in the history, flora and fauna that make Lough Key so unique. This is a self-guided tour so therefore there is no time limit on your journey through time…… The beauty of this is that you can spend as much or little time as you want on this magical journey. This Mass Rock was typical of many used in mid-17th Century Ireland as a location for Catholic worship. Owing to the difficulty and danger of religious practices at the time, as a result of Cromwell’s campaign in Ireland and the Penal Laws, this banned congregation and worship. A stone was usually taken from church ruins and relocated to an isolated rural area with a simple cross carved on its top. Masses were held in secret. Her father Captain C. J. O’Sullivan was adjutant to the Connaught Rangers in the town. In 1988 she visited the town after a 40 year absence and unveiled the plaque on the house in which she had been born. She also attended a celebration mass in St Josephs Church, a parade through Boyle to Main Street, planted a tree on Military Road, attended a variety concert in the Royal Hotel, planted a Monkey Puzzle tree in Riversdale House, Knockvicar and went on a boat trip around Lough Key. Main Street, Boyle during Maureen O’Sullivan’s visit to the town in 1988. The pleasure grounds were created by Lord Kingston in front of his castle (before the building of King House) as one of two parks where the gentry might ‘promenade and discourse’. The other for the people of the town extended west of Bridge Street to St. Patricks Well. Initially, these parks restricted the development of the town to Bridge Street and Green Street. From here one will get the best view of King House. The house has an eleven bay front, set off by a central three bay pediment. containing a large Venetian Window. The regular chimneys, dormer windows and vaulted roof giv an impressive glance. In 1809 Viscount Lorton commissioned the famous architect John Nash to build a lavish mansion in the Rockingham Demesne on the slightly elevated hill that overlooks Lough Key. Around the same time he also commissioned the famous landscape architect John Sutherland to create a landscaped park. This involved building bridges, canals, follies as well as the planting of numerous trees. Rockingham Arch is an example of the numerous gate lodges that were built in the early 1800’s on the estate while Viscount Lorton was landlord. This was the entrance to the estate from Abbeytown. This fine Gothic style gate house formed a spectacular entrance into the Rockingham Demesne, now Lough Key Forest Park. The gate house was possibly designed by the architect John Nash, who was responsible for the house, or by his draftsman Humphrey Repton who is credited with the design of many of Rockingham's lodges. This building, with its crenellated parapet and limestone dressings differs hugely from the other more classically designed lodges associated with the demesne. Built in a Gothic idiom, it is an outstanding and an impressive entranceway to the estate. Consecrated in 1980, this modern building is redolent of Ireland’s past and reminds one of Newgrange. It was designed by Patrick Rooney & Associates of Sligo and Dublin. It is constructed of random quarried atone commonly found locally. The 34 metre roof span is achieved by the clever use of laminated spruce beams. The foundation stone of this church was blessed by Pope John Paul, on the occasion of his visit to Knock in September 1979 and laid in position by the Bishop of Elphin, Most Rev. Dr. Conway, on the feast of St. Joseph the worker. The organ was made by Kenneth Jones of Glendalough and Bray, 1981. The above church replaced an 1876 neo-gothic church designed by George Goldie (who also designed Sligo and Ballaghaderreen Cathedral), it had a magnificent pitch pine, hammer beam style roof, and a striking rose stained glass window above the alter. It took over six years to build after laying the foundation stone, at a cost of approximately €8,000. The church was accidently burnt down in 1977. 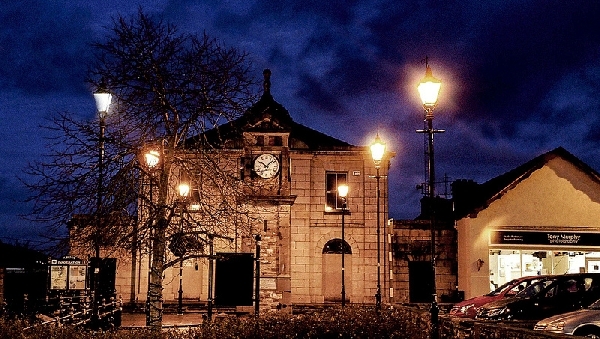 Prior to 1876 the Catholic Church was on the other side of Boyle in St. Patricks Hall.